The Voce AV 5.1k amplifier has been given the Grand Prix Award, annually assigned by the Japanese “Auto Sound” magazine, the most important award for car audio in Japan and one of the most prestigious in the world. 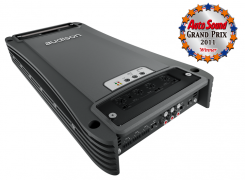 A few months ago, Audison AV 5.1k received the EISA award, for the “In-Car Electronics” category, and attained the title of “European In-Car Amplifier 2011-2012”; now it has received another significant acknowledgement. « When I received the information that the Audison AV 5.1k was rewarded with the Grand Prix Award by the highly qualified “Auto Sound” magazine I said to myself: this is a nice day. It is always a pleasure to receive an award, but in this case the pleasure is especially great. We realized the AV 5.1k project as the ideal amplifier to install in our personal car, with the fear that the product may not be properly understood by the market. To find out all the awards won by Elettromedia products, visit the Awards page on the Elettromedia website.